We’d love your help. Let us know what’s wrong with this preview of Towards a New Architecture by Le Corbusier. For the Swiss-born architect and city planner Le Corbusier (Charles-Édouard Jeanneret, 1887–1965), architecture constituted a noble art, an exalted calling in which the architect combined plastic invention, intellectual speculation, and higher mathematics to go beyond mere utilitarian needs, beyond "style," to achieve a pure creation of the spirit which established "emotio For the Swiss-born architect and city planner Le Corbusier (Charles-Édouard Jeanneret, 1887–1965), architecture constituted a noble art, an exalted calling in which the architect combined plastic invention, intellectual speculation, and higher mathematics to go beyond mere utilitarian needs, beyond "style," to achieve a pure creation of the spirit which established "emotional relationships by means of raw materials." The first major exposition of his ideas appeared in Vers une Architecture (1923), a compilation of articles originally written by Le Corbusier for his own avant-garde magazine, L'Esprit Nouveau. The present volume is an unabridged English translation of the 13th French edition of that historic manifesto, in which Le Corbusier expounded his technical and aesthetic theories, views on industry, economics, relation of form to function, the "mass-production spirit," and much else. A principal prophet of the "modern" movement in architecture, and a near-legendary figure of the "International School," he designed some of the twentieth century's most memorable buildings: Chapel at Ronchamp; Swiss dormitory at the Cité Universitaire, Paris; Unité d'Habitation, Marseilles; and many more. Le Corbusier brought great passion and intelligence to these essays, which present his ideas in a concise, pithy style, studded with epigrammatic, often provocative, observations: "American engineers overwhelm with their calculations our expiring architecture." "Architecture is stifled by custom. It is the only profession in which progress is not considered necessary." "A cathedral is not very beautiful . . ." and "Rome is the damnation of the half-educated. To send architectural students to Rome is to cripple them for life." Profusely illustrated with over 200 line drawings and photographs of his own works and other structures he considered important, Towards a New Architecture is indispensable reading for architects, city planners, and cultural historians―but will intrigue anyone fascinated by the wide-ranging ideas, unvarnished opinions, and innovative theories of one of this century's master builders. To ask other readers questions about Towards a New Architecture, please sign up. R This paperback has 189 pages. When I was in architecture school in England, Corb, as we called him, was the master (and Alvar Aalto the disciple). He stated the case for modern architecture so convincingly that it seemed the only possible altenative. In his hands, it was beautiful and practical, and also economical. He had a zen spareness about his work, and a sculptural gift. His drawings and his furniture are exciting, without being gaudy. Quite the opposite. He exemplified Less is More. And he taught me, and a generation When I was in architecture school in England, Corb, as we called him, was the master (and Alvar Aalto the disciple). He stated the case for modern architecture so convincingly that it seemed the only possible altenative. In his hands, it was beautiful and practical, and also economical. He had a zen spareness about his work, and a sculptural gift. His drawings and his furniture are exciting, without being gaudy. Quite the opposite. He exemplified Less is More. And he taught me, and a generation of architecture students, 'the discipline of the route.' Buildings, as he taught us, are not experienced whole, but as a series of experiences. Orchestrating those, and making sure that the visitor is always oriented to the whole, is the basic given of good architecture, like writing a grammatical sentence is a given for a good writer. Unfortunately, this is often forgotten today. This book is his concise statement of his philosophy. Most architecture since then either follows its dictates or rebels against them. 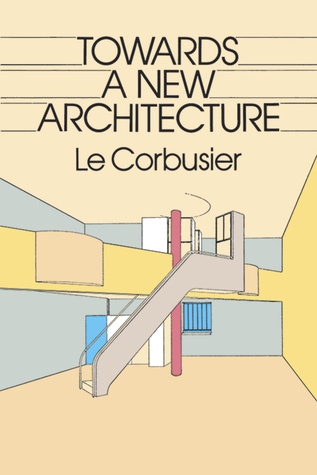 I don't like the way Le Corbusier writes, but this book is epic. As a student of architecture I learned a lot from this book, mostly about the five principles of Modern Architecture. It isn't a boring book, but you have to be careful to interpretate some things he writes. It is definetly a must-read. Is this a foundational text that gives me a better framework for understanding 20th-century architecture? Yes. Did I strongly dislike it? Also yes. “Decoration is of a sensorial and elementary order, as is colour, and is suited to simple races, peasants and savages. Harmony and proportion i Is this a foundational text that gives me a better framework for understanding 20th-century architecture? Yes. Did I strongly dislike it? Also yes. I think this is a fundamental misstatement of the modern problem – to my mind, the old and familiar, the colorful and decorative, provide a sense of comfort and repose from the alienating pace of the modern world, which subjects humans to a rate of change we aren’t built to withstand. I'm giving this book a four star rating, not because it is such good reading, but because it and the ideas of Swiss architect Le Corbusier were so influential in making the world as we know it. His model of separation of work and residential sectors of cities, with vehicular traffic on the edges was followed all over the world for much of the 20th century. All those apartment blocks--both luxury and urban renewal--are the direct descendants of his tower in the park plans. So was the draconian re I'm giving this book a four star rating, not because it is such good reading, but because it and the ideas of Swiss architect Le Corbusier were so influential in making the world as we know it. His model of separation of work and residential sectors of cities, with vehicular traffic on the edges was followed all over the world for much of the 20th century. All those apartment blocks--both luxury and urban renewal--are the direct descendants of his tower in the park plans. So was the draconian remaking of cities by removing old housing and changing street patterns. Ditto, although a little indirectly, for the suburban communities where you must have a car to get around, where through traffic goes around development, and where a corner store that you could walk to is non-existent. OK, this is a loaded review: this book and its author are my betes noir (excuse my nonexistent/incorrect French...the least revenge I can have...) - facile and mystifyingly still persuasive to generation after generation of architecture students and True Believers, despite the empirical evidence of the damage it wrought and the dubious actual quality of the man's work (this review being by someone who worked, practically lived, in the Carpenter Center for four years...and that building, unlike a OK, this is a loaded review: this book and its author are my betes noir (excuse my nonexistent/incorrect French...the least revenge I can have...) - facile and mystifyingly still persuasive to generation after generation of architecture students and True Believers, despite the empirical evidence of the damage it wrought and the dubious actual quality of the man's work (this review being by someone who worked, practically lived, in the Carpenter Center for four years...and that building, unlike any other by Corbusier, WAS beautifully executed thanks to Josep Lluis Sert [exec. architect] and armies of Maine boatbuilders doing the formwork, not to mention Harvard footing the bill...it's cool sculpture, in the end, and studio space CAN be in most anything...but it's a dire environment and devoid of charm as a human habitation...). I can only say, the emperor remains naked to me...ok, go back to your Gauloises and Adorno now. "The house is a machine for living in." other themes are things like being true to the time and purpose for which you are designing, and creating the new rather than making surface copies of the old. "Rome is the damnation of the half-educated. To send architectural students to Rome is to cripple them for life." For whatever the GR star system is worth, I've never awarded such a low score for a writer I had so much respect for. Le Corbusier has such a powerful vision in 'Towards a New Architecture. ; When we take into consideration the traditional currents he was swimming against, it's even more impressive an achievement. The writing is pretty airy, allowing thoughts to navigate freely around "Rome is the damnation of the half-educated. To send architectural students to Rome is to cripple them for life." For whatever the GR star system is worth, I've never awarded such a low score for a writer I had so much respect for. Le Corbusier has such a powerful vision in 'Towards a New Architecture. ; When we take into consideration the traditional currents he was swimming against, it's even more impressive an achievement. The writing is pretty airy, allowing thoughts to navigate freely around the points Corb makes like traveling through big massive superhighways as overstated as the ALL CAPS he sometimes chooses to hammer as if he were writing an angry streak on a comments board. During this journey I had to revisit Anna Chave's essay on the rhetoric of power in minimalism—her equation of Minimalism's masculine power with the classical Doric reminded me of Corb's love of the Parthenon, a monument which made many appearances throughout this work (that, and American grain elevators...). What Corb argues for is at once functional, a house as a "machine for living in," yet poetic in its timeless geometry which reflects the highest spiritual endeavors of mankind. The cancer Corb wishes to operate on is the sort of excess that permits asymmetry—that which yearns, the Gothic, which hysterically reaches out towards infinity as if to "fight gravity." Or that which allows for pockets of silence within calamity like the Rococo, with it's irregularities and crevices. For Corb, these monstrous nightmares are nothing if not excessive, exposing some embarrassing fixation like a wound. Corb's excess (for there is nothing without excess) is his unwavering commitment to symmetry and space. To clean lines and clean living. What is essentially called for here is a guarantee against the sort of willfulness which may fester in the crevices of feminine flowerings of the decorative arts (another named enemy of Corb). In the New Architecture, the machine itself is the excess, and the will must become subordinate to the rites of efficiency and convenience which will be manifest in the new order of work and leisure. Entire cities will have to be reconstructed! Back to Chave's essay on minimalism—Chave mentions that Barbara Rose and Lucy Lippard said of Minimalism that it was a categorical refusal of the humanist mission of art: "a negative denial and renunciation [...] a rejective art." I understand Corb's New Architecture in very much the same way. Corb is allergic to any architecture which would allow for a fold in the social fabric. In his project he seeks to remove spontaneity and the unpredictable from our cities—and it's not that there's anything all that special about spontaneity in itself, but the attempt to eradicate willfulness and desire is not just impossible, but a harmful premise for architecture and the people who must live with such a paranoiac program. Anna Chave characterized Minimalism as an objection to relationships and intimacy in art. I see Corb's New Architecture an analogous objection. I read this book for a class assignment, I was looking forward to it because Le Corbusier is the biggest influence of the modern era of architecture, his principles are still up to date and architects all around the world still learn and apply his theories today (though I am not sure they should). I found interesting to learn his reasonings for sustaning his Principles of Architecture,and for a thorough understanding I recommend also reading: The Athens Charter where his influence is noticeable I read this book for a class assignment, I was looking forward to it because Le Corbusier is the biggest influence of the modern era of architecture, his principles are still up to date and architects all around the world still learn and apply his theories today (though I am not sure they should). I found interesting to learn his reasonings for sustaning his Principles of Architecture,and for a thorough understanding I recommend also reading: The Athens Charter where his influence is noticeable on the statements about city planning. Apart form reading this and other books of his, I think it is much interesting and insightful to study his projects (real and theoretical) because they demonstrate how possible (or not) it was for Le Corbusier to stick to his principle and make them work (most of them didn't). I have also read about his life and relationships with clients and other artists and colleagues (which is fascinating to me)and one can learn that his personality affected his work enormously; and tragically I concluded that his ego and stubbornness didn't allow him to accept reality (I think he really disliked people)and adapt his theories to people actual needs. I really loved this book. Lecorbusier, one of the founding fathers of the modernist movement, puts forward his arguments for society's embracing the 'mass production spirit'. It's common knowledge that it hasn't really worked out as he expected it to but so much of what he has written has contributed to architecture. This book is full of innovative designs which unfortunately inspired poor implementations (high-rise poor areas all over the place). however, that says more against society's treatm I really loved this book. Lecorbusier, one of the founding fathers of the modernist movement, puts forward his arguments for society's embracing the 'mass production spirit'. It's common knowledge that it hasn't really worked out as he expected it to but so much of what he has written has contributed to architecture. This book is full of innovative designs which unfortunately inspired poor implementations (high-rise poor areas all over the place). however, that says more against society's treatment of the lower classes than against the value of lecorbusier's ideas entering the public domain. I could not help smiling while reading some of lecorbusier's more outrageous declarations. Every third sentence in this collection of essays is a maxim. but i guess it's necessary to take into account that he was fighting against a tide at the time and in order to instigate change (like anybody else attempting to do the same) he needed to be forceful. I often disagree with him and he's often completely wrong but this really is a fascinating book. "You employ stone, wood and concrete, and with these materials you build houses and palaces. That is construction. Ingenuity is at work. But suddenly you touch my heart, you do me good, I am happy and I say: "This is beautiful." That is Architecture. Art enters in." I hate his eyesore buildings that I've been forced to look at in numerous areas of the planet, and I really, really hate his ideas. To Le Corbusier, the essence of architecture, really, is a rhythm of lines aimed at capturing the complex language of mass, surface and plan. If all these elements gel well together, the buildings will turn out to be a masterpiece, incorporating the different shades of light perfectly. Meanwhile, he also argued that the objective of architecture is to create happiness for its inhabitants while striving to remain relevant to its building function. This proves that Le Corbusier is not just a mere To Le Corbusier, the essence of architecture, really, is a rhythm of lines aimed at capturing the complex language of mass, surface and plan. If all these elements gel well together, the buildings will turn out to be a masterpiece, incorporating the different shades of light perfectly. Meanwhile, he also argued that the objective of architecture is to create happiness for its inhabitants while striving to remain relevant to its building function. This proves that Le Corbusier is not just a mere modernist of his time, his radical functional approach to architecture has rendered the notion of "sense of place" almost obsolete. The immediate result is always gloomy and bleak. His architectural visions have been trialed numerous times in Soviet Russia, without any surprise, the psychological well-being of these citizens is not great. Many committed suicide. Nonetheless, he contributed much to how architecture can be imagined. He cautioned architects not to be easily deceived by 'styles' as 'a house is merely a machine to live in'. Rather, form should always follow function. Another important impression which this book left me pondering was that architecture goes hand-in-hand with zeitgeist. So, what is the zeitgeist of our era, which many events and inventions have taken place long after Le Corbusier's departure from this world? This book is a mandatory read if you're interested in the history of architecture. Corbusier's writing can be dense, and he tends to wax poetically, but the ideas contained within are fundamental to modernism. Certainly, some of his ideas are daaaaaated and would no longer hold up in modern planning discourse, but it's an interesting look into the optimism of mid century modernists (I mean, a whole city built on piloti!?). Un libro para disfrutarlo paso a paso, con calma para asimilar lo que Corbusier nos quiere transmitir. Si bien es cierto que la arquitectura en serie esta subvalorada el concepto que presente Corbusier es sumamente interesante, centrando la arquitectura alrededor de la vida del usuario y de su transcurrir. Una lectura muy recomendable. I enjoyed reading this book. I am a lover of art and architecture, of course. This book took me back to my college days when I took a class called ART AND ARCHITECTURE (as if the two are not one and the same). I enjoyed the time spent reading and remembering my former experiences. My son is now an artist who works in the field of architecture. Kniha, která byla na mě příliš náročná (spíš jde o filozofickou knihu) a podle mě ji ocením až později, kdy budu architektuře lépe rozumnět a chápat ji. Není divu, že ji milují studenti architektury, kteří tím vlastně žijí a někteří i podobným jazykem dokonce i mluví. Já se k tomu nejdříve budu muset dopracovat. An architecture student's must-read. While many proposals are considered obsolete, the book introduces a lot of the key ideas and issues that architects must confront. This book is also constantly reference throughout the discipline. Modernist architecture's flagship text; btw, when you become the boss, you would be able to write in such a discursive, fractured and repetitive style without being penalized by painful grad students and perhaps some common readers that tried to grasp your idea. Le Corbusier was a revolutionary architect, but not enough emphasis is placed on the harm his rhetoric has caused and continues to cause the profession of architecture and our cities. Perhaps he ended up doing more harm than good. A good theory book, obviously a very advanced idea in that context. Hvað sem fólki kann að finnast, þá er þetta byltingarkenndur texti skrifaður af manni sem var afskaplega áhugaverður. Svo mikið af issues. Greyið. Yes this is the Bible of modern architecture but at times I felt it too nonsensical. Charles-Édouard Jeanneret-Gris, better known as Le Corbusier; was an architect, designer, painter, urban planner, writer, and one of the pioneers of what is now called modern architecture. He was born in Switzerland and became a French citizen in 1930. His career spanned five decades, with his buildings constructed throughout Europe, India, and America. He was a pioneer in studies of modern high d Charles-Édouard Jeanneret-Gris, better known as Le Corbusier; was an architect, designer, painter, urban planner, writer, and one of the pioneers of what is now called modern architecture. He was born in Switzerland and became a French citizen in 1930. His career spanned five decades, with his buildings constructed throughout Europe, India, and America. He was a pioneer in studies of modern high design and was dedicated to providing better living conditions for the residents of crowded cities. He was awarded the Frank P. Brown Medal and AIA Gold Medal in 1961.